Thank you for your support of the Grosse Pointe South football program. We believe that football helps build character in the young men of our community, is a source of student and alumni pride for our school, and is a unique American tradition. With your help, we can sustain and build South football as the premiere program in Michigan. Funds raised by this alumni event support alumni initiatives including scholarships, capital improvements and the current football program. 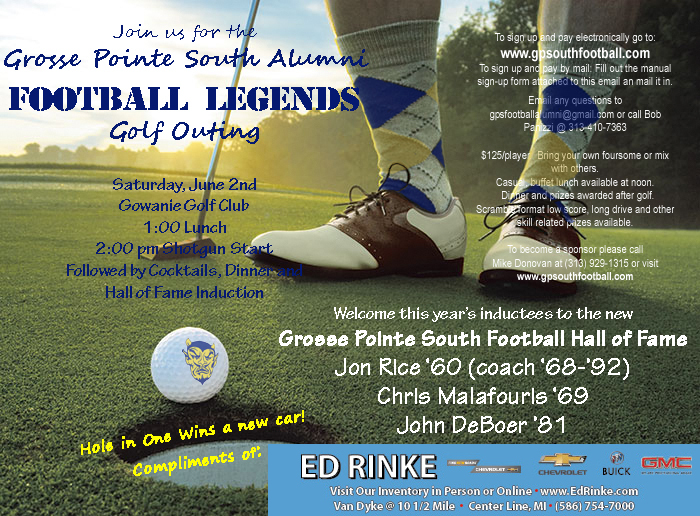 You can become a sponsor of this year's Grosse Pointe South Blue Devil Football Legends Golf Outing by contacting one of the co-chairmen below or sending a note to gpsfootballalumni@gmail.com. Here are some of the most popular sponsorship opportunites available. If you or your business would like to participate in some other fashion, please call Mike Donovan at 313.929.1315.